Students Against Othering’s (SAO) mission is to educate the public about the dangers and consequences of othering, specifically in relation to Muslims and Arabs. We here at SAO hope to educate the general public about the existence of othering, and how it effects many minority groups. We hope to raise awareness through showing identifiable examples of othering, and how this is a part of everyday life for targeted minorities such as Muslims and Arabs. Our goal is to show that our differences as human beings should be celebrated, and that we as a people should work toward understanding rather than assimilation. Respect, awareness, and understanding of different cultures are vital aspects to the solution to othering. Unfortunately, othering is one of the many results of unequal power dynamics, but we hope to convince people with and without power to treat one another with respect and understanding, and therefore diminish othering worldwide. Phillip Toledano’s installation project is a thought-provoking compilation of artwork based upon the idea, “If American foreign policy had a gift shop, what would it sell?” Toledano critiques various foreign policies of the past eight years through the representation of various objects that are traditionally given as souvenirs. In Toledano’s words, “At the end of a trip, we buy a souvenir to remind ourselves of the experience. What do we have to remind ourselves of the events of the last eight years? And who will be held accountable for what has unfolded? Once the sugar coating of the ordinary dissolves, we are left with the grim truth about where we’ve been as a nation.” Many of the eighteen items in Toledano’s display portray actions and policy related to torture. Of these items related to torture, all are explicitly linked to the torture of Arabs and Arab Americans. For example, Item 1: Inflatable Guantanamo Bay Bouncy Prison Cell, Item 2: Abu Ghraib Coffee Table, Item 3: I Was Rendered (T-Shirt), Item 5: Abu Ghraib Bobble-head, Item 10: Secret Prison Postcards, Item 11: Abu Ghraib Cookie Jar, and Items 15/16: Fairground Cutout (without and with people). The fact that so many of the 18 items in the compilation are regarding torture in the Middle East is disturbingly representative of how pervasive these actions have been in American foreign policy in recent years. Taken out of context, Toledano’s work could easily be interpreted as flippant, disrespectful, disturbing and even disgusting. Within the context of his mission statement, however, Toledano’s pieces are an insightful look at America’s actions abroad, and the way in which he demonstrates torture through such mundane objects really highlights its grotesque nature. 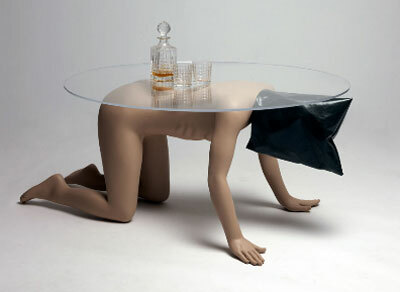 Item 2: Abu Ghraib Coffee Table is especially poignant and immediately draws to mind the infamous images that were leaked from the Abu Ghraib detention center. Toledano’s collection also calls to mind the blatant othering that is present in American foreign policy and how this is reflected in the acts of torture that are depicted. Steven Salaita speaks of this in his article, “Anti-Arab Racism in the USA”. Salaita raises the issue that in discussion of torture at Abu Ghraib, “the racism of the abuses was hardly mentioned” (190) while, “…most rationalizations of Abu Ghraib insinuated, or stated outright, that the United States is more civilized than and therefore superior to the Arab World.” (191). Salaita goes on to say, “…the abuse of so-called inferior peoples isn’t now an aberration and never has been; there would be no United States if the abuse of countless Others had never happened. To forget this history is tantamount to validating it.” Salaita’s words are in direct alignment with Toledano’s mission statement which calls for not only a remembering of the actions of the United States, but an examination of foreign policy and who is responsible it. Othering clearly plays a dynamic role in all facets of this issue and the beauty of Toledano’s artwork is that it becomes impossible to ignore the ridiculousness of viewing a torture victim as the Other, rather than a human being. Toledano's work also provides a visual analysis of power dynamics, representing the United States as the group with power, just as it so often is in real life and almost always is in realtion to the Middle East. Unfortunately, having power often turns into abusing power, and torture and Toledano's depiction of it is a perfect example of this trend.